San Diego State rallied back from a 15-point deficit late in the first half to lead by eight points with 2:50 left to go in regulation only to collapse in the final minutes. The Aztecs (19-11, 11-6 Mountain West) lost 76-74 to the Fresno State (21-8, 12-5) on Wednesday to a sold-out crowd at home. It was Senior Night at Viejas Arena and the Aztecs were supposed to send their graduating seniors off with a win. It was the first time San Diego State lost on Senior Night since Feb. 28, 2005. Before Wednesday, SDSU has won 13 straight Senior Night games, the fourth-longest active streak in the country. SDSU was still leading by six points (72-66) inside the one-minute marker when Deshon Taylor made a 3-pointer with 62 seconds to go. 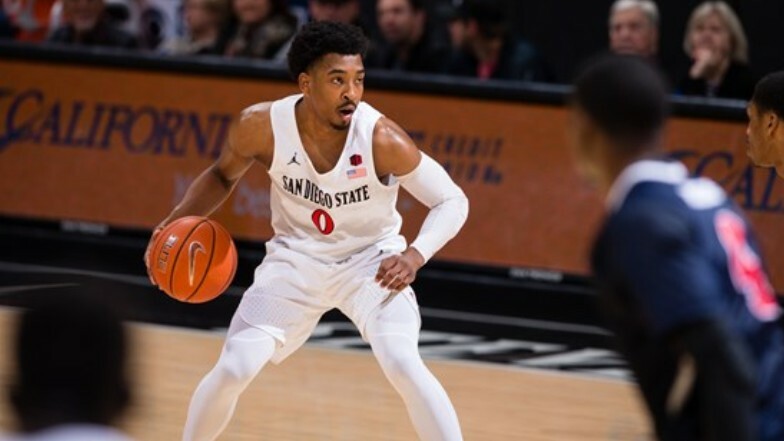 The Aztecs then committed three-straight turnovers that were converted into six points to give the Bulldogs a 75-72 lead with 21 seconds left. The Aztecs still had a chance to win when Jalen McDaniels was fouled with 10 seconds left attempting a 3-pointer. He made two of his three free throws. Fresno State rebounded and Taylor made a free throw. McDaniels then rebounded the ball to Devin Watson, who missed a desperate 3 at the buzzer. Under NCCA rules, coaches can only call a timeout when the ball is dead. Once the ball is in play, only players can call a timeout. None of them did, even though SDSU has three timeouts left. With the loss, SDSU clinches the No. 4 seed in the Mountain West Tournament, regardless of what happens Saturday against Nevada, which has more to lose. The Wolfpack is currently half a game behind Utah State and can clinch the No. 1 seed in the tournament with a win. The Aztecs, however, have nothing to lose and could play spoiler. The game that Dutcher is more concerned about, however, is the quarterfinals against UNLV, which has already clinched the fifth seed. The Aztecs will be playing the Rebels on their home court on March 14. “Content will be the king” -this remarks has always been saying by people.